That thumb stud is great! Do all the Blurs have that or is unique to this one? I have a friend who had a very well used Blur that was in need of a new pivot, new clip screws, and a new clip. Kershaw sent him multiples of every part he needed (and I think a few others) to get the knife back up and running. That is excellent customer service. Matt, Yes! That thumb stud comes standard with every Blur. It’s a very nice design and I’d love to see it in some other knives. I purchased a Blur in S30V as a gift for my son. This blade was intended to replace the tired, well used EDC he was carrying. Before he received it, I pulled it out of the box to look it over. I’ve always considered U.S. made Kershaws to be an excellent value, and this was no exception. The overall fit/finish and build quality were great. Being a quirky kind of tinkerer, I completely disassembled the knife. After micro polishing the bronze washers and all the friction areas on the moving parts, I then treated it with Militec 1. I also replaced the factory grease in the torsion bar cavity with a very high grade synthetic grease. I topped everything off with some stropping of the blade. This may sound like overkill, but the results were scary fast deployment of a scary sharp blade. Needless to say, he loves this thing…. The things we do for our kids. Thanks for the review Dan, it really helped out with the decision making process. Seriously though man, that is very cool. I am a huge fan of the Blur, especially the plain edge, drop point version in S30V like you gave your son. It’s just a rock solid EDC knife, could spring into more defensive roles too if need be. Just really well done overall. And the USA made Kershaws are excellent, just love em to death. Thanks for stopping by man! I really dig the blade markings and color scheme on the handle of your Blur. I got the Blur S30V a few months ago but the handle is just black on black. Makes me wonder if I can tape off the Trac-tec inserts and paint it with a light coat of Rusto or Krylon to give it some curb appeal. I ended up rounding off the thumb studs a bit with a bench grinder on mine because they were uncomfortably sharp. When I kept it clipped in my pocket, I would scratch my hand every time I’d reach in there for my cellphone. But a few quick zaps on a stone did the trick! Great knife, even better review! You might be able to color it with some vinyl dye, that stuff is specially formulated for plastics – might come in some cool colors too. You cab find it in the spray paint section. Interesting mod man, I like that idea, pretty neat. Glad you enjoyed the review man, thanks for stopping by! Hey Kevin, I like that version as well. It’s actually a limited run Kershaw did with a composite ZDP189 blade so unfortunately, you can’t buy that version new anymore (might be able to find them on ebay or something). I will say, kershaw recently released the blur in a couple of nice new color schemes. Knifecenter has a nice selection. If you want, you can check em out here. How does this knife compare with the Zero Tolerance 350?? Great question Peter! I’d say they are very similar in build quality and fit and finish – unsurprising given that they are both made in the USA by Kershaw. They are both Ken Onion designs so you will see a lot of similarities. The Blur is slim and sleek, and better suited for “normal” surburban EDC. The 0350 is heavier and chunkier, and will be viewed more as a “hard use” tool (and you can see in the comments of my 0350 review that several law enforcement officers carry this as a duty blade). So I think build quality will be very similar. They also do make the Blur in S30V so the steel will be the same. It comes down to what design you like more. I happen to think they are both excellent knives. I hope this helps a little, thanks for the great question! I carry one of these in the glassbreaker version. I like the glassbreaker feature as it makes this knife even more multi-functional. I can think of lots of situations where this feature might come in handy. I love the quick open too. My only complaint is I wish the clip allowed for a deeper carry. I would recommend this knife to anyone. Thanks for the comment, I am glad to hear you have been enjoying your Blur. I agree that the glassbreaker does add an extra level of functionality, and I also agree that a deeper carry clip would be nice. Ken Onion tends to put rather “interesting” clips on his knives. I tend to prefer the more straightforward and utilitarian clips myself. I believe the Blackout is an overseas manufactured Kershaw with a plastic handle and I vaguely remember handling one and not being that impressed. The Blur should be a much nicer knife for a variety of reasons. I picked up a Blur in 2008, 1670BRNSG2, in laminated Super Gold 2 steel. I paid $90.97 for it. I have a lot of knives, and it has remained my top favorite EDC. The edge is amazing, stays sharp through a week of cardboard, twine, poly rope, hose repair, pencil sharpening, and bamboo cutting boards. My sharpening interval has grown as I’ve been surprised again and again at how well the blade keeps its edge. Thanks for dropping by. The Blur is a modern classic and one of my favorite Ken Onion designs. Thank you for the feedback on yours. This one has a way of staying in people’s collections. I would have bought from your link but, New York – New York. Amazon sells at $58 but won’t deliver to my preferred address in New York. $30 extra as compared to Amazon at BassPro. But, “they” shall get it delivered. I broke the tip of my #Buck110 while “prying” an aquarium light power-plug. Choices are to send it from India to Buck or get the blade re-profiled locally and that shall mean immediately getting it back AND a stronger tip, as well! I am completely sold out to a #KershawBlur S30V but cannot get it delivered to New York from where my friend is coming to India in December and shall bring it. #Benchmade940 is deliverable and is also on top of the list but I get put-off by the rather slim design. Confusion, confusion and some more confusion! 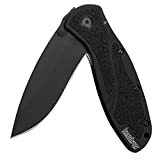 It’s cyber Monday 2018, and I just found and bought the Kershaw Blur S30V for less than $56! Even cheaper than the base model! I’ve never owned a Blur but I do own the Link and the Dividend as well as a couple more of the Chinese-made Kershaws, all Speedsafe deployment. I do have a small budget edc collection that includes SOG, Boker Plus, Spyderco, Buck, and CRKT knives but I just love the action on a Kershaw Speedsafe knife and I’m ready for this one to be the front runner in the collection. Cole, Congrats on acquiring the Blur at a great price. It’s an excellent knife. I hope you enjoy it.